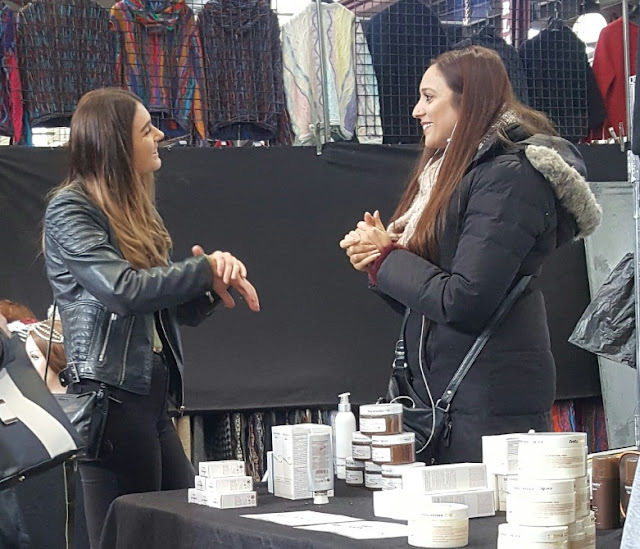 We have written about the success of this year’s Winter Night Market but only in terms of general impressions from a few general merchandise traders who are lucky enough to trade at the night market. The terminology that stands out is “a great product….that exceeds expectations.” We can’t help but wonder what could be done with a clean slate for the day market. Have Your Say– click here. 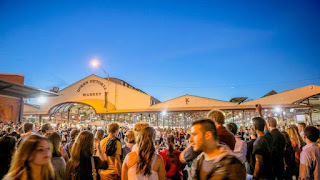 Surely, it's obvious - pour as much effort into the day market as the Night Markets....."
So would that effort involve curating a market like the night market or something different? - Ed. 03/07/2017 15:17:40 Winter Night Market Performance Revealed "Most definitely curating the day market, giving both the day market and Night Market the same amount of respect. I could go on and on, but this is it in a nutshell." 02/07/2017 22:47:28 New Marketing Programs "How wonderful it would be to see a marketing program that gave the same amount of energy & buzz into the day market as is spent on the Night Markets." 3rd Gen Trader. 1. Super Retail Group says it will manage competition from Amazon. 2. Ted Baker profits rise following international expansion. 3. Topshop franchisee blames poor inventory control for failure of Australian operation. 4. Melbourne Airport’s new T2 luxury precinct attracts major international retailers. 5. Ikea launches virtual reality store in Townsville. 6. Amazon makes major $13.4b grocery chain purchase. 7. Aldi plans 900 new stores in US. 8. KFC to trial home delivery. 9. Moodys downgrades 12 Australian banks including the big 4. 10. Amazons purchase of Whole Foods Group shows it is serious about groceries. 11. Oroton sees no end to sales slump – shareholder pumps in cash. 12. Amazon ‘s new acquisition, Whole Foods US, is equivalent to half IGA in our market. 13. Apple and Ikea work towards virtual reality furniture shopping. 14. Forever 21 the latest fashion retailer to report lacklustre demand. 15. Oroton Group puts itself up for sale. 16. Nestle buys into prepared meal market. 17. Nike slashes 1400 jobs as it expands direct to consumer sales. 18. Retail Food group cuts profit forecast. Retail Success: An interesting article from Dennis Price about Shopping Centre success although I warn you, we are not a shopping centre. It includes the comment - "The balance of power between landlord and tenant will oscillate during the transition, even if it now favours the retailer in most instances." And there are more gems. Different Trading Atmosphere – One of our day traders who also trades at the Night Market laments the fact that night time customers are prepared to pay $15 for entrée size meals while daytime customers want to bargain for every penny. Different time, different clientele. 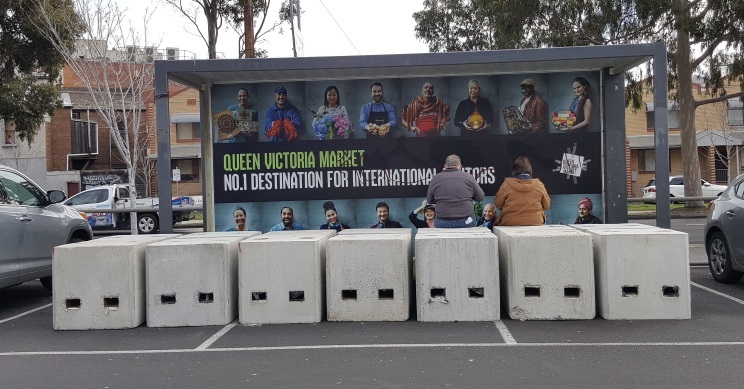 Concrete Bollards – Anti-terror bollards are in the news with various public places receiving their allocation including QVM. Ours seem to be stored in the car park for now. modern technology this photo was sent to QVM security who were able to monitor the situation. New Food In F Shed – rumour has it that the Jeans shop at the bottom of F Shed has been sold with a food vendor to come in. New Night Market – Management are seeking traders for a new Asian food inspired Night market to commence in October. When you’re hot you’re hot. Rent Reductions – Traders are quietly talking about rent reductions to help us through these tough times. One trader is proposing that a 30% rent reduction should be applied but only to 5 day traders who make the maximum contribution to the market. His proposal may be a little controversial although as he points out, if a number of 2,3, or 4 day traders are encouraged to take advantage of 5 day trading then that would be a plus for lots of reasons including lower stall vacancies. 26/06/2017 08:45:59 New night market "Is this stir frydays revisited?" successful Wednesday Night formula and its going to be under the sheds not on Therry Street. ...I would say not. " Sometimes we bring about change doing the big important things and sometimes we achieve results by doing multiple smaller things - the one percenters. Both can be important in creating change. Sustainability is one factor that is at the forefront for many consumers. 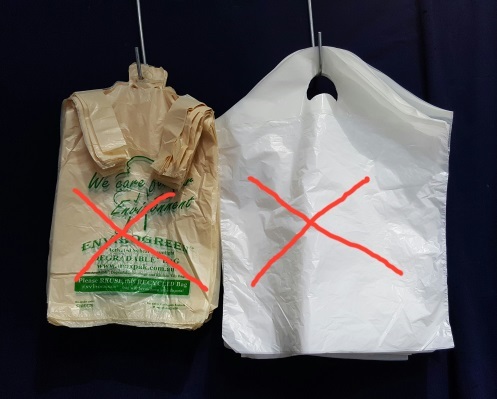 Our photos show an example of a trader transitioning from ocean polluting plastic bags to recyclable and sustainable paper bags. The result is a better looking product and a healthier environment. Maybe worth 2%. Engaging Traders is about traders engaging with their customers. 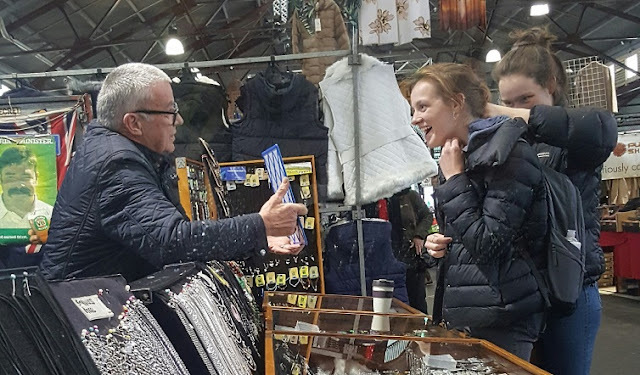 We have compiled a small collection of photos showing what traders do best - professionally engaging their customers and turning a selling opportunity into a rich personal experience for both buyer and seller. Not all sales work out that way but those that do are memorable and deserve capturing. We like the concept so much that we have created a special tab at the top of our homepage labelled "Engaging Traders" where you can see the complete collection and maybe even see yourself one day. Does Our Market Need To Get Smaller To Survive? There is plenty of talk around the top end of QVM about the likelihood of traders leaving as we battle declining sales. What will that mean for the future structure of the market? It now some 6 years ago that the idea of converting J,K,L,M sheds to an events space was first presented. The proposition was that the face of retailing was changing rapidly and the over-supply of General Merchandise Traders could be countered by the growing need in Melbourne for events space. For many there are positives to a smaller market. It makes sense to adjust trader numbers to consumer demand and we know that many factors have influenced the demand factor – declining wages, rising living costs, alternative sources of shopping, and so on. A smaller market would be an opportunity to get rid of duplication (that needs to be carefully managed) address issues like trading hours, and hopefully create a smaller number of traders sharing the same consumer pie (or perhaps a bigger pie if we do it properly) and all making a reasonable living. As one executive pointed out this week, we need to be aware of what impact any reduction in trader numbers will have on the overall appeal of the market. That is a valid point and this needs to be managed properly but 6 years is already far too long to activate a proper response to the dramatic changes in retailing. If the Night Markets are any guide then perhaps we will end up with a top end day market that is 50% food and 50% general merchandise. 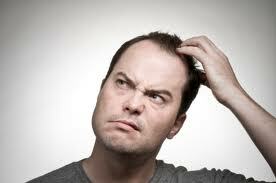 Many top end traders are asking for action although in fairness to the debate there are still some who seek no change. While inaction and slow decline continue those seeking action are likely to grow in number. This is not a time for scare-mongering but just how far do we let decline go before it becomes terminal? 26/06/2017 22:11:23 Market Decline "You've covered a smaller market size & and rental discounts for stall holders to ease the decline in business however one incident that a lot of traders are talking about is the small number of traders that thought having a few drinks during a Saturday trade was a fun idea. Imagine what customers were viewing traders drinking, drunk & sleeping it off at their stall. A lot of traders are trying their best to project the Market in a good light and that wasn't a good look and does bother to help our declining image." You are right - that wasn't a good look, but lesson learned, and I think we can say with those involved it will not happen again - time to move on. Thanks for your input. - Ed. Small business operators like market traders are in particular danger of developing mental health issues according to a US study and when you look at stress factors for Queen Victoria market traders it makes a lot of sense. The study found that entrepreneurs were 30% more likely to suffer depression than everyday people. And it is the very factors that often first attracted us to retailing that are the cause. It is the stress created by striving for success, chasing goals, gambling on outcomes, and often seeking perfection in what we do. It is pushing ourselves, going it alone, and the feeling of self esteem (or more critically the lack of it) that influences our everyday working lives. And right at the moment it is the feeling that we are not completely in control – slaves to consumer sentiment, constantly changing technology and the slow ponderous progress of those in charge of change. On the one hand we wouldn’t have it any other way. We need to be in charge of our destiny, we get a rich buzz from everyday opportunities. On the other hand we are victims to the frustrations that exist particularly when times are tough. One trader described his frustrations to me recently by saying that he can handle the general downturn at present. He knew when he signed on for retailing that there would be tough times. He knows that he has to tighten the belt while always looking for changes that might be opportunities. But one thing really gets to him. It is the time between customers. 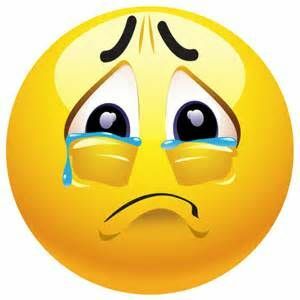 That long period when he has to keep a smile on his face and a positive attitude when in truth nobody loves him. He admits that is a ridiculously emotional response and laughs it off but most traders will understand what he is getting at. This article may seem to be a ramble through the obvious – we are in tough times. But its aim is to illustrate that many of us are in the same situation. Some of us will need to make hard decisions about our futures. The important thing is that we realise we are not alone. We do need to be open about our feelings with those around us and we need to take advantage of the many forms of professional help that are available to traders. 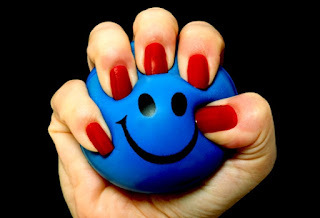 We are in a high risk group for mental stress and it just makes good sense to manage the risk. 19/06/2017 08:04:11 Post Office at QVM "Peel St. is full of small ""Post Offices"" and they are very busy. UPDATE: The feedback feature we attempted to introduce on these pages was devised by Google back in 2008. It turns out that more modern filtering practices can play havoc with responses and we had a number of complaints from traders whose responses showed up on their computers but disappeared when they logged back in. 1. Body Shop sold to Natura, owner of Aesop cosmetic brand. 2. Sumo Salad enters voluntary administration as it battles Westfield over rents. 3. K-Mart introduces new price cuts as it ups the competition. 4. Temple & Webster opens first outlet store in Richmond. 5. Walmart says it will aim to be “People led and tech empowered”. In a graveyard of disappointing results from major US retailers Home Depot has exceeded analysts expectations and the reasons why could be a lesson for all retailers. 1. Nailing their online experience with quicker check in/check out times. 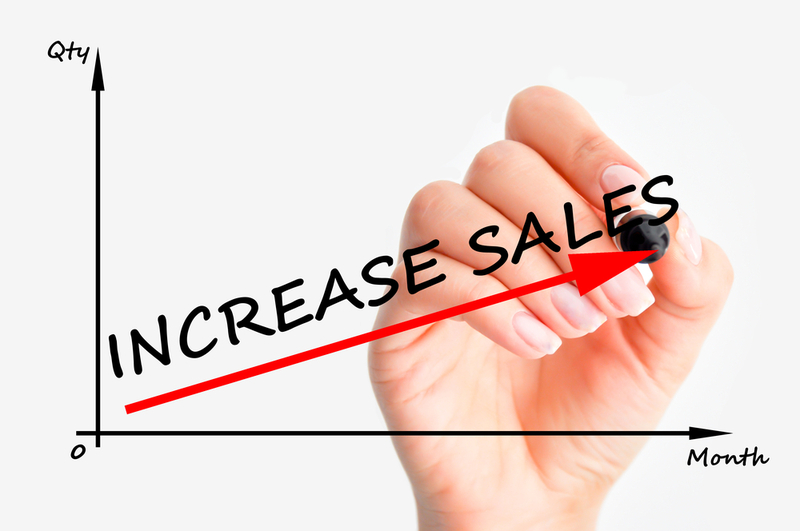 Making it easier for online customers has reduced delays and increased sales. Online represents 6.6% of Home Depot sales. 2. Fine tuning their app. Personalising the experience for app users including relevance for location and buying patterns. 3. Broadening their customer appeal. While other retailers become obsessed with consumer groups, like millennials, Home Depot acknowledges all categories of customers. 4. Spreading its supplier base. This provides insurance against things they can't control like supplier bankruptcies. 5. Keeping in touch with innovation like LED lighting and pet proof carpet. 6. A robust in-house credit card. 22.6% of their sales are conducted through their own credit card. Forbes concludes that Home Depot have concentrate on the retail basics and simply made them better. Paper Carry Bags – one of our traders is not convinced that going eco friendly by ditching plastic bags really makes sense. See our article - http://www.victraders.com/2017/06/the-new-consumer-demand-that-traders.html He points out that 3000 plastic carry bags cost him $35 while the equivalent in paper would be closer to $1500. Measuring the value of adjusting to consumer sentiment was never going to be easy. More Security Staff – a number of traders have commented on the increased presence of security staff around our market. 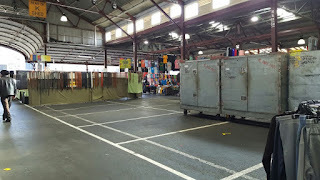 Night Market a Winner – no figures yet but a couple of participant traders say the crowds are very impressive at our Winter Night market with one saying he had difficulty handling the rush on Wednesday night this week. Leases and Licenses are Back – a rumour last week that a Victoria Street trader has been offered a 5 year lease has been followed by the appearance of letters to SL licensees advising of a phased return to formal licences. Great news for those looking for some stability in our future. 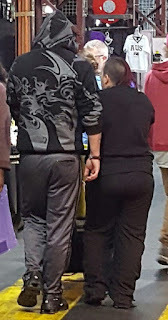 Bring Back Fashion – while our clothing traders continue to struggle one of our long term traders has suggested a positive remedy. He is proposing the market establish a substantial scholarship with one of Melbourne’s highly regarded design schools and offers a section of the market to budding clothing designers. Setting up a formal design precinct would add to QVM’s “small business incubator” tag, create a destination for fashion buyers, and surely add a potential flow on to our existing clothing traders. Sounds like a great idea. Has there ever been so much change in retailing? 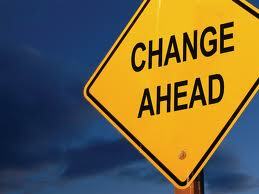 It is difficult to try and list all the changes over the last 12 months, much less the time since the GFC. Experimentation for retailers has become the norm and many retailers are urgently chasing new ideas to see what might stick and give them a leg up on their competitors. This trend was highlighted by Walmart's announcement this week that it was going to ask employees to deliver customer orders on their way home from work. Seriously!!!!!!! IKEA are experimenting with a whole range of new concepts to do with things like store size, and augmented reality and one of their officials admitted - "We're trying to do as many things as possible to see what works.....it's like, the more the merrier." Change itself may be the only constant as a genuine retail revolution encourages retailers to experiment with a whole range of options. And, of course, the problem is which do you tack onto. A smart retailer won't rush into every new trend but stagnation is probably more damaging (check out the list of retail failures this year). The online/instore transition still has a long way to go but the interesting swing from bricks'n'mortar to pure online to a combination of both is starting to become a little clearer. Personal service with the assistance of digital catalogues in smaller footprint stores with alternative delivery options seems to be the path at present. One big advantage of experimenting is that it usually involves a closer relationship with your customers and that should be good right? Unless of course your idea is a disaster and then you have some repair work to do. Walmart might be having some conversations with their employees right now. HaveYour Say – click here. "Coffee Shopping" is a new term in retailing, and no, coffee shopping is not shopping for coffee. The idea comes from China and it is all about creating a coffee shop experience in a store. It is providing a relaxed friendly atmosphere with friendly people (think Apple Stores) and instead of magazines, using digital formats to browse through products and assist in your purchase. Rather than wander aimlessly through aisles and aisles of stock you are more focused and you have assistance from staff and digital catalogues. So it is providing more of a one on one experience, with a very broad range of options at your fingertips. Coffee Shopping is likely to produce smaller stores (many retailers like Target and IKEA are heading in that direction) and possibly home delivery rather than carrying goods with you. You might also be offered a cup of coffee as part of the experience. Is It Time We Curated Our Market? Curating is defined as – “to select, organize, and present (online content, merchandise, information, etc. ), typically using professional or expert knowledge.” It is the opposite to ad-hoc organising which, with no disrespect to our organisers, has been the experience during no vacancy times at QVM. But times have changed as our photo shows (taken in KL during normal trading hours last Friday) and as recent experience, particularly with A Shed has indicated. The look is extremely damaging, but it can, and must be managed if we are to ride out the current retail downturn. And we know what can be done by looking at our night market. 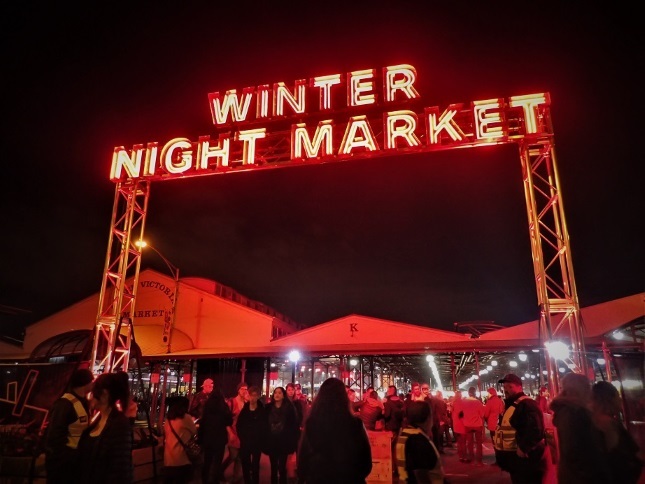 The Night Market is a carefully curated operation with walls, and artificial boundaries. Shopping centres are full of elaborate hoardings with “Exciting retailer coming soon” signs. Things can be done. 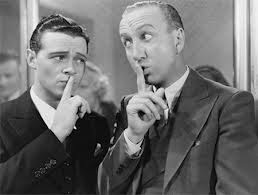 A number of experienced traders have expressed the view that we must correct our rambling presentation to consumers. Many are talking about doing whatever it takes to create a unified offer enhanced by “buzz” factors (food, drink, entertainment) even if it means moving all top end traders over into J,K,L,M sheds or the reverse, moving all into C,D,E, and F sheds. Neither option is without complications and difficulties, but it would appear the sentiment, and the time, is right for change. What do you think? 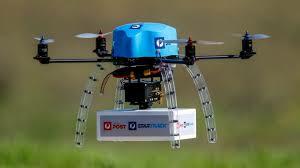 A business presentation for traders had to be cancelled today due to lack of interest from traders and that deserves some kick back..
Australia Post were to present to traders on some of their latest innovations in their online customer engagement and parcel delivery services. These have been globally identified as two key elements for retailers looking to move with the times as consumers trend to technology and convenience when buying goods. But the presentation at QVM was cancelled due to lack of trader interest. Food delivery services are growing in popularity, fired up particularly by Amazon's relentless march to same day delivery for all its customers. Australian and international air travellers are constantly hounded by airlines to reduce their luggage. So it is surprising that, with thousands of tourists on our doorstep everyday, very few of us offer a convenient delivery alternative to help guarantee that we get their business. And the presentation by Australia Post was cancelled this week due to lack of trader interest. Online buying is a growing component of consumer decision making and it is no wonder why. Two weeks ago on a Wednesday I discovered that I was about to run out of printer ink needed for printing labels and leaflets for my market business. At two o'clock on that Wednesday I placed an online order with a Melbourne printing cartridge supplier through eBay. At 10 o'clock the next morning (less than 24 hours) the cartridges arrived at my post office for pickup. That is service, although if I am honest, the postage gods were unusually active that day. Yet a presentation by Australia Post to show how traders could offer online services was cancelled due to lack of trader interest. There is a tendency for some traders to separate retailing into bricks'n'mortar and online. That is partly because they are quite different in nature and partly because online seems a little too technical to comfortably embrace. Change is hard. But our customers have no such problem. They are simply looking for a convenient way to buy goods and whether we like or not, that will sometimes mean visiting a shop, and sometimes buying online, or at least over the phone. I recently had reason to search for a watch online for a special family occasion and I was astonished at how web presence has changed. I found the usual niche online watch suppliers but they are now joined by Myer, David Jones, Thomas The Jewellers, and a whole range of mainstream retailers. Try searching online for a common shopping item and see how many traditional retailers show up. Personal and personable service will always be our strength as market traders but it will not be enough on its own. As retailers we need to offer those extra services that help grab sales, no matter how foreign or uncomfortable they might be right now. Simple logic suggests they will become second nature, and it is all those one percenters that add up to success. And one final point - Walmart in the US announced this week that they are thinking of asking employees to deliver customer orders on their way home as part of their war with Amazon. One commentator described the idea as "crazy". Nobody has the magic bullet to retail success. Obviously the big boys of retailing are really struggling to find answers just like us. Market Traders are not alone in this revolution but we are a little more flexible. Constantly informing ourselves and actively making smart changes will give at least some of us a good chance of success. And one more final point (sorry). This is not just a Trader problem. QVM have to go full steam ahead on promoting our wonderful market through all the means at their disposal. They also need to ensure that smart renewal changes that will prepare our market for the future get through the various government and interest group blockades. But they are only part of the equation. Active, hungry, entrepreneurial, and informed traders are critical to QVM's success. There is no room for "lack of trader interest". You will notice that we have introduced feedback options at the bottom of each article on Victraders. Similar to a Facebook "like". Readers will be able to indicate whether they like an article, find the article useful, or seek more information. No doubt there will be times when readers might like to express more forceful and perhaps less positive responses but we decided to leave "You are joking", or "Bin it!" 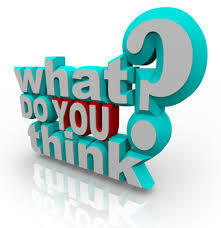 to the Have Your Say facility which is always open to individual comment. 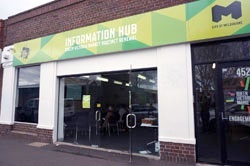 The presentation by Australia Post scheduled for Thursday 15th June at 3:30pm in the Engagement Hub has been cancelled due to insufficient trader response. Australia Post were to talk about trader options in relation to online selling and parcel delivery. We understand that traders will often find it difficult to commit to after-market activities in advance. If you feel there could be value in this sort of presentation please indicate with a "Like" in the box below, and perhaps the presentation can be rescheduled. Retail change is moving at such a fast pace that keeping a handle on what is important can be difficult but delivery services keep rising to the top of customer considerations and market traders are not immune to the change. 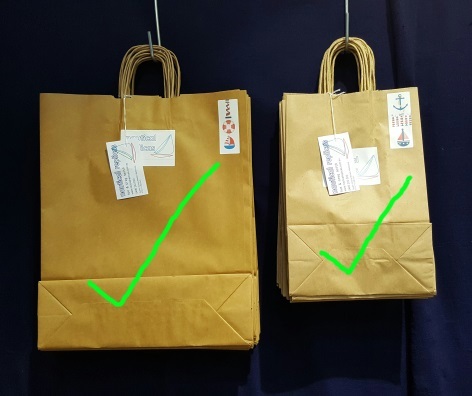 "If you don't offer a delivery option, somebody else will"
We have written many times here about how customer convenience is a prime consideration for retailers looking to capture sales. We have quickly transitioned from customers doing their own deliveries (i.e. 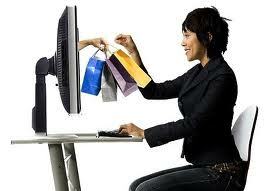 picking up their goods during shopping trips) to retailers, both online and in store, taking on that responsibility. Purchase decisions change dramatically when the customer realises he or she doesn't have to buy right now, but can organise delivery to their homes later. The point here of course is that if your business doesn't offer a delivery service, somebody else will. The cutting edge of delivery services involves fast and easy transactions with retailers like Amazon moving quickly to next day, same day, and two-hour city deliveries. Amazon is aiming for delivery within the hour via drone for every customer. According to the ABC, 23% of Australians are prepared to pay a premium for same day delivery. 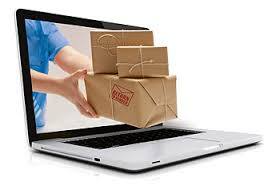 Online purchases are growing dramatically and delivery services are meeting the challenge. Who would have thought that delivering fragile cartons of wine to your door would become so common? Customers are clearly becoming used to delivery as a viable option for just about any purchase. The big advantage that retailers used to have was immediacy – if you wanted your purchase within a reasonable time frame then you had to go to a store to pick it up. That line is now very blurred. As market traders grapple with maintaining their relevance in the fast moving retail industry, delivery services may just be a key factor. What delivery services does your market business offer? Australia Post have positioned themselves as a key player in parcel delivery and they are visiting our market this coming Thursday at the Engagement Hub on Queen St. at 3:30pm. This is one meeting that maybe you shouldn't miss. 1. Kikki.K to launch in Nordstrom stores across US. 2. Choice says Aldi is Australia’s cheapest supermarket. 3. Struggling US department store, Sears, to increase number of store closures to 180. 4. Coles intends putting bakeries in 180 more stores. 5. Amazon to offer 45% discount on its Prime membership to low income earners. 6. Australia’s economy grew at just 0.3% in March quarter. 7. Target to trim store portfolio but remains coy on actual store closures. 8. Coles and Woolworths feature in top 20 worlds most valuable brands. 9. Coke may ditch Zero brand. A global pattern is emerging about how retailers are tackling the retail revolution and it includes many different actions some of which are taking place at QVM. Much effort is going into engaging more closely with customers particularly through digital avenues like social media. Services to customers are being enhanced in regard to communication, delivery, payment and general convenience. There are many positive, pro-active measures being introduced as retailers look to increase sales. At the same time there is a strong analysis of cost effectiveness and profitability as retailers examine their operations. The string of store closures, downsizing, and staff reductions are a real focus in the US as major retailers reveal that a staggering number of stores are earmarked for closure. So while there are proactive measures to engage with customers and increase sales, there are also control measures as the reality of reduced consumer demand and more competition makes it necessary to cut costs, perhaps reduce store numbers, and introduce efficiencies. It is unlikely that QVM and its 600+ traders will be immune from that process.